Geron might actually have an exciting MF drug in imetelstat. The results hinted at in the pre-show abstract and elaborated upon in formal presentation by Dr. Ayalew Tefferi Monday, December 9 certainly suggest the molecule is a potentially potent means to roll back the effects of myelofibrosis. Among the highlights are very high response rates, including complete response or resolution of symptoms, bone marrow fibrosis, and splenomegaly all achieved in record time. But Geron’s flat-footed blend of showmanship and financial antics are not helping this small pilot study build credibility as it hurtles toward clinical trial next year. Geron briefly made a ton of paper money on December 6 when an embargoed press release was published on the Mayo Clinic website claiming extraordinary results for its Imetelstat drug. (The release was later taken down.) Its stock soared before falling back to realistic levels once investors realized nothing had changed. It’s not the first time advance notice of positive company news has been fed to stock analysts and investment media. 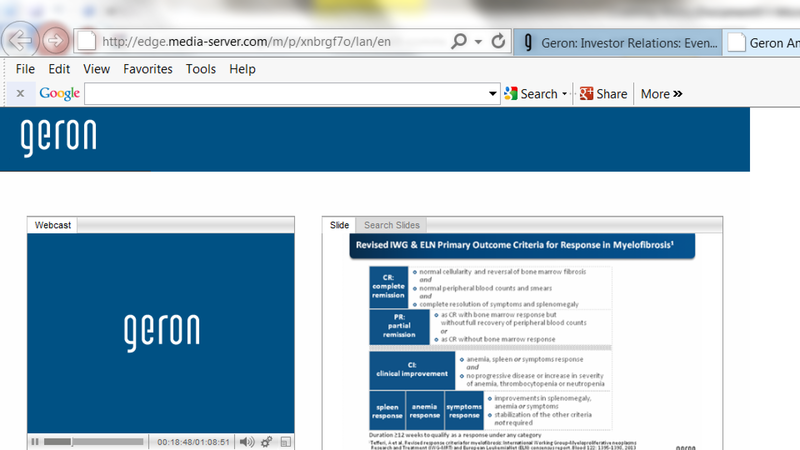 Clearly Geron needs deep pockets to move imetelstat through the coming clinical trials in 2014 and beyond. But scheduling a heavily promoted on-line webcast for investors and analysts only one hour after Dr. Ayalew Tefferi’s scheduled presentation at ASH seems a bit desperate. Despite imetelstat’s checkered career — failure in breast cancer and not much success in lung cancer, until its big boost by reducing the JAK2 allele burden in its essential thrombocythemia trial, reported last year at ASH — the drug clearly produces response. Maybe too much response, as toxicity and safety issues continue to surface. (See Slides.) 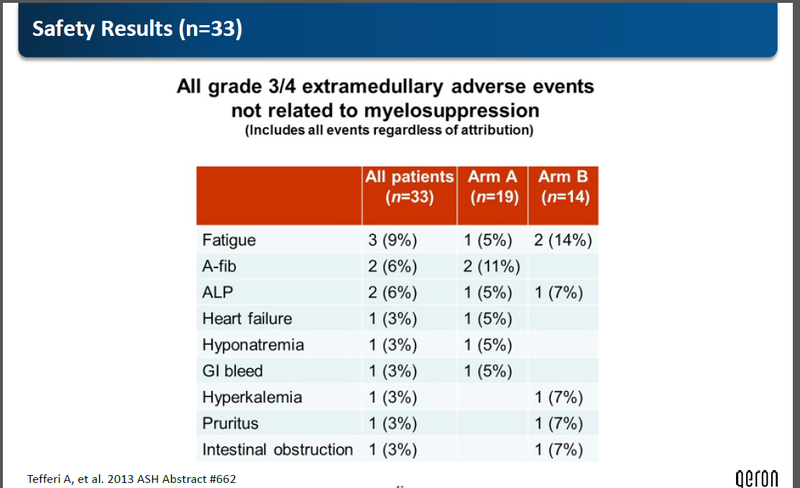 However there is little doubt that the myelosuppressive activity of imetelstat has produced some partial and complete responses in record time, based on Dr. Ayalew Tefferi’s presentation at ASH Monday evening. With imetelstat infection and side effects already an issue, it would have been useful to hear more of means taken to reduce severe adverse events in the coming imetelstat trials. Once dosage regimens are brought under control, the targeting of hematopoietic stem cells without engaging other systems will have to prove out over longer term study. And there are good indications it will. The on-going 18 patient ET study has some patients on drug for nearly three years, according to Morgan Lam who wears many hats at Geron. On targeting, Lam believes imetelstat will not run into problems. “…Most cells do not express telomerase. That enzyme is turned off except for certain stem cells and malignant cells. Certain cells,” says Lam” have more need for telomerase..for those cells, primarily hematapoietic stem cells, imetelstat will be more effective.” Lam also talked about reversal of fibrosis and the targeting of marrow fibroblasts. In that context, here is a brief clip from Dr. Claire Harrison on the restoration of hematopoiesis and emerging data on potential involvement of the mutant JAK2 clone in precursor cells as part of the MF disease process itself. Telomeres are the repetitive code at the ends of chromosomes. The main function of telomeres is to preserve the integrity of the chromosome, avoid fusion, inappropriate combination. They’re often compared to shoelace tips. Telomeres are also, in a sense, the ticking clock of most normal cells. They grow smaller — less code — each time most cells divide. until a certain minimum size is reached and the cell can no longer divide and dies. Telomerase is an enzyme that supports the survival of the telomere. In the presence of telomerase, telomeres maintain or elongate their structure and protect the dividing cell.The ideal target for such an attack would be leukemic cells functioning with relatively short telomeres, cells that depend on a telomerase rich environment. Some cells, like stem cells in the bone marrow, continue to divide during our entire lives, a function made possible by the presence of telomerase. But malignant cells can also flourish when supplied with telomerase. Imetelstat is a technology and drug with seemingly great potential. Its ability to reverse fibrosis and restore hematopoietic function would appear to rival that of stem cell transplant. It’s just very early — far too early — to claim victory over myelofibrosis. We don’t know enough about adverse effects, long-term effects, durability of response or the response of a much more diverse and extensive cohort of patients in a controlled multi-site setting. Geron needs a partner to undertake the long, expensive clinical trial process. The sharp fall in stock price after premature announcement of findings looks like there may be some work to do on that front before development can move into high gear. As patients, we can expect a clinical trial by the middle of next year… but it will be awhile before this whole story can be known. 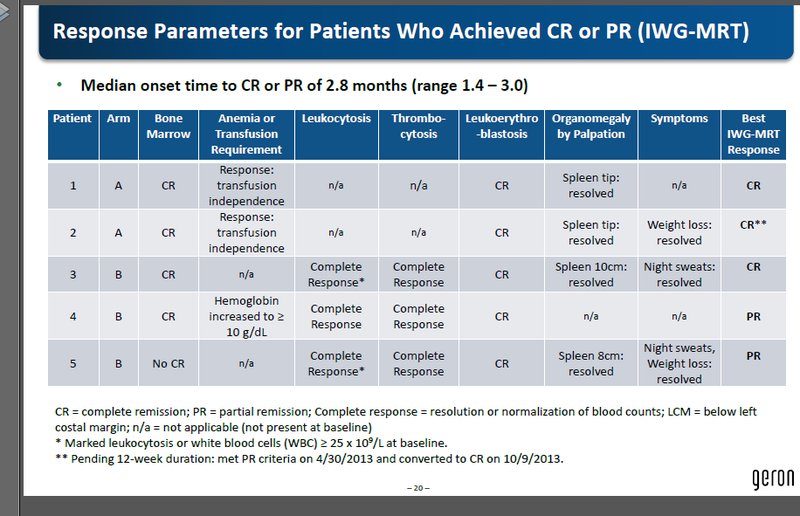 Here is the slide set from Dr. Baerlocher’s EHA 2013 presentation. By reading the exchanges above, I can only see hypocrisy!! If the author wants to emphasize technical aspects, no further statements in responses should be made on share-price hikes or paper profits or even costs of trials and whether Geron can handle the costs or not. Why would somebody who claims this platform exclusively for the wellbeing of patients be so critical of any new and the only one invention so far that has a potential for helping the patients recover from the life threatening disease baffles me! Keep singing the song of lack of long-duration results (the trials are still undergoing and we all know that!) and incomplete (perhaps inaccurate) explanation of why some 5 patients in the Mayo trial is shocking to me. Anyhow, to me it appears that the author clearly doubts efficacy of Imetelstat by arguing about lack of long-term results ignoring positive aspects of the results, no matter how short-term the results are. Also, to me, the author seems to be upset about Dr. Tefferi’s emphasis on lack of PRs and CRs if Jakafi inhibitors are used. Dear Yogesh Shah… Thank you for writing. The policy of MPNforum, stated on the home page at http://www.mpnforum.com is personal attack is prohibited….beyond being a rude way to open a comment. On the chance you are an MPN patient or caregiver and not a Geron shareholder seeking publicity, let me answer you personally. I am the author of the article in question. As editor, and a long-term MPN patient, I have seen friends die of this disease, have friends suffering and dying tonight. For the past five years, I have had myelofibrosis. I am hardly against seeing this drug succeed. MPNforum has reported more fully, I believe, than any other publication on the full results of Dr. Tefferi’s pilot study. We published the full abstract. We published his comments at his ASH presentation. We published Geron’s full slide set from John Scarlett’s presentation to Analysts. Dr. Baerlocher’s EHA presentation. And we published an interview with Geron’s chief medical officer and a live account of Dr. Tefferi’s presentation at a patient support group. Along with this objective reporting, you are right. We have taken pains to put these findings and the surrounding corporate activities in perspective for good reason. There has been open, aggressive recruiting for an Imetelstat trial, the protocol of which has not yet been made public. MPN patients are eager to participate. My objective is to present facts that might lower immediate expectations of a “cure” so patients can proceed with existing effective interventions, if possible. The reasons are simple: The trial drop-out rate, the historic toxicity issues around Imetelstat and, most of all, the very early and partial results from a small and short-term pilot study that we have always characterized as promising but preliminary. At ASH there were papers quietly presented on discovery of a mutation in the CALR gene producing a mutated protein found in JAK negative patients. This is likely to be as significant as the discovery of the JAK2 mutation a few years back…and yet there was no chest-thumping introduction. The pairing of Imetelstatstudy results with characterization of JAK2 inhibitors as dangerous and ineffective and the claim of a major and historic breakthrough was, to me, premature and pure showmanship and had no place at ASH. If any patient avoids a stem cell transplant in hopes of a quick Imetelstat fix let it be upon the advice of his medical team…not reliance on Geron press releases and an excess of optimism. You may not agree with my conclusions but I hope you value the objectivity of our reporting — separate from opinion – and our commitment to present a balanced view to our MPN community. I own no stock. I have no other ax to grind. Let Imetelstat succeed in its clinical trials and MPNforum will be as enthusiastic and supportive as you now find us skeptical. It’s clear that this article is written only to attack Dr. Tefferi and Geron. To MF patients, imetelstat and Dr. Tefferi’s work could be a very important milestone – CRs were achieved with this drug. Your negative tone in this article makes people feel that Dr. Tefferi and Geron are doing something wrong or hiding something while you have no evidence to support your allegations. It’s sad to see you infuse fear into desperate patients who are searching for any hope to cure this terrible disease. Jerry, I have MF. I have friends who have died of this disease, are sickened by it this very night. I know what it means to hope for a cure. Your comment is so off-base I felt it didn’t warrant a response. Still, you deserve the respect an honestly expressed opinion requires and the record of our article needs to be cleared of your unfair characterization. Imetelstat is a technology and drug with seemingly great potential. Its ability to reverse fibrosis and restore hematopoietic function would appear to rival that of stem cell transplant. It’s just very early — far too early — to claim victory over myelofibrosis. We don’t know enough about adverse effects, long-term effects, durability of response or the response of a much more diverse and extensive cohort of patients in a controlled multi-site setting. The negative reports you refer to all had to do with (1) Dr. Tefferi’s attack on the JAK inhibitors at a meeting our reporter attended to learn about Imetelstat. We included a transcript of those remarks; and (2) We objected to the violation of a blockaded press release and Geron’s scheduling of an analyst meeting immediately after Dr. Tefferi’s presentation. The mixture of science and finance cast a showbiz spotlight on what should have been a sober announcement of significant pilot study findings. Beyond saying it is far too early to claim victory over MF based on this small scale, single site study – a statement no independent specialist on Planet Earth would dispute – we characterize Imetelstat as promising throughout the article. I agree with you that hope is vital to all of us suffering with this awful disease. But hope prematurely arrived at can lead us to postpone established therapies or lead us into risky Phase I/II toxicity and dosage clinical trials of an experimental drug that might weaken our already compromised systems. I appreciate that you let my comment go through. 1. The Mayo early release of PR: so far it’s clearly a mistake by the IT or PR department of Mayo Clinic. However you accused that Geron and Dr. Tefferi had something to do with it. It’s a very serious accusation. If Geron/Dr. Tefferi released the PR early to manipulate the stock price, it would a criminal act and you should report it to SEC immediately. I doubt you have any evidence to support this view. 2. It’s Geron’s shareholders who financially support the development of Imetelstat, they are entitled to know any clinical progress. Geron has raised so far more than $1 Billion from its shareholders to develop Imetelstat and other drugs. I think you and MF patients should be grateful to Geron shareholders no matter whether the Imetelstat will be successful or not. It’s also SEC’s requirement that company needs to disclose material information to investors in a timely manner. Dr. Scarlett’s presentation was nothing promotional but about the clinical results that Dr. Tefferi released at ASH. Appreciation in Geron’s stock shouldn’t cause you any concern, on the contrary, as an MF patient, you should be happy that financial markets support Geron’s further development of Imetelstat. 3. Dr. Tefferi, as a scientist and a doctor, is entitled to his opinion on other MF drugs. Jerry, your comment was published since it is our policy to hear all sides of an issue and not judge whether or not the writer endorses MPNforum’s position or not. You raise an issue that requires response. Our role is to report objectively and view corporate data – particularly press releases – with skepticism until proven demonstrably true. MF patients are excited about Imetelstat and the upcoming clinical trial based as much on press coverage as hard data. For some it will undoubtedly be the right choice, for others, not. We need to approach this trial with cautious optimism, not boosterism. Once the new research protocol is available, along with our hematologists we can carefully assess the risk/benefits of participating in light of clinical conditions and alternative treatment options. The premature publication of the embargoed press release first appeared on the Mayo Clinic website on September 5. We accurately reported the market’s response. That press release was embargoed until the ASH meeting September 9. ( Is there anything about “embargo” that you don’t understand? ) The decision to break the embargo and publish the release on the internationally followed Mayo Clinic webpage is legitimately viewed with some dismay no matter the manner of its occurrence. You don’t do science with press releases. Finally, your suggestion that “… MF patients should be grateful to Geron shareholders no matter whether the Imetelstat will be successful or not.” is both wrong-headed and revealing. There is no reason to be grateful to shareholders for investing in a drug from which they hope to profit. They are not in it to help us but to enrich themselves. Our gratitude needs to extend to the patients who suffered and died in the course of this and prior failed Imetelstat trials, the front line warriors in our battle against MF. Hopefully all were fully informed and exercised their best options. We’re determined to help see that’s the case. We should be very careful in suggesting improper behavior by the researchers who are struggling to find treatments/cures for our diseases. In particular Dr. Tefferi, who was been tirelessly working on our behalf for so many years. I have a patient of his for two decades, and he has always been the model of a caring clinician in addition to being a great researcher. Knowing his attitudes towards such things, Dr. T. Is the last doctor I would expect to be influenced or corrupted by the drug companies. You should not even suggest or infer such behavior unless you have actual proof. To speculate the worst of motives on a man who who is working with what I think are the best of motives is irresponsible. This isn’t a muckraking journal, it should be a factual report on the progress of MPN research. Immetelstat is a small, hopeful piece of good news, not a shocking scandal. Thanks Tom for voicing your opinion but I have to admit your comment surprises me. It would be inconceivable for us to think Dr.Tefferi could be corrupted by a drug company. He has been a very loud and outspoken opponent of drug company influence in our MPN world. 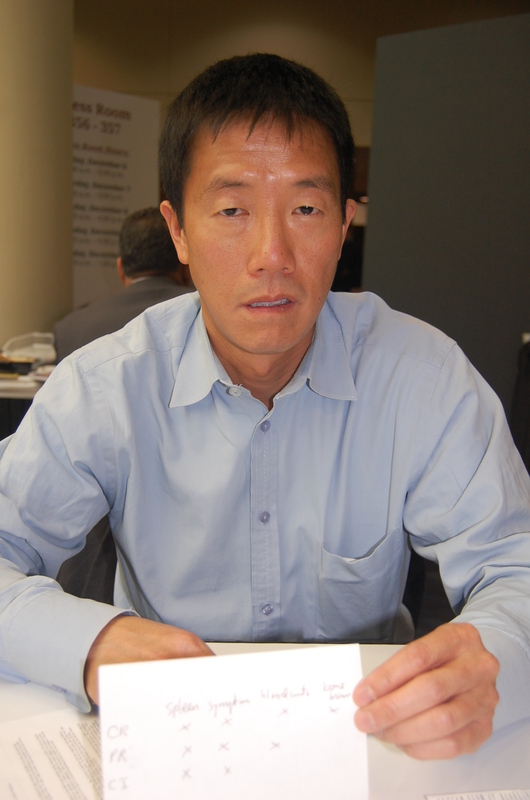 We have reported extensively on his opposition to physicians appearing to promote drugs. His status as a pre-eminent published researcher of foundational MPN papers is incontestable. And his reputation as a compassionate, caring clinician has been noted by many patients and reported in MPNforum. In our story, we regretted the time Dr.Tefferi spent attacking JAK inhibitors both in the past and in his ASH presentation and were embarrassed by Geron management’s timing of development announcements. Those comments were based on specific reported actions. For the rest, our report is entirely factual, based on data and charts presented at ASH, and largely positive. We share your hopes for Imetelstat’s efficacy but will reserve judgment on that until broad clinical trial data is available to review. Let me also object to your characterization of our report as muckraking. We report and analyze events affecting MPN patients and caregivers. The intro to Imetelstat is one such event. There has been extraordinary and understandable optimism among MPN patients based on the near miraculous results reported for Imetalstat at ASH. That needs to be placed in perspective so patients don’t postpone available treatment in hopes of possible benefit from an unproven drug. We have no idea of Imetalstat’s durability of response, long-term effects, or efficacy in a broad-based patient population. Along with hope we need patience. On Jak inhibitors Tefferi tells it like it is. The problem as I see it here, Taylor, is that you put your support in Tefferi as if he and Imetelstadt was a football team in the NFL. And you see the others as competitors against Tefferi or enemies. It makes you biased. I would love to see Tefferi succeed, but I would also prefer to see him being honest in his work. One can argue that he, for instance, seems to be exaggerating the dangerous of BMT to promote his own research and talk down JAK-inhibitors without bringing any, as we know so far, proven solution to the table. J I have been following Imetelstat and its developement as a Cancer treatment for a long time. Why because Cancer has effected most of the people in my life. Grand father died AML. Aunt dead stomach cancer. Stepfather dead Intestinal Cancer. Mother Survived 2 years stage 4 Squemous cell Cancer head and neck after disfiguring surgery and radiation now showning signs of developing brain mets. Two of three sisters have Breast Cancer. Wife had Malignant Melanoma stage 2. Best freinds mom died from NSCL Cancer. Another freind died last year to Esophagial Cancer and if I am lucky I will die from a massive corinary like my dad so I do not suffer from the Mesothelioma that is in my future. J Imetelstat is afirst in class treatment that targets the proliferative pathway of Cancer it is based on the work of Backburn and Greiber both who won Nobel prizes for that work. Being first in Class ment they combined it with taxols in solid tumors because in the lab it worked well but in real life the combo could not be used because of shared toxicities made effective dosing impractical. Imetelstat with a PARP inhibitor looks like it will work better than the taxol combo and not allow Imetelstat resistant cancer mutations to form but then again this is preclinical. I am now more synical about charities that raise money for the cure than drug companies that actualy spend most of their money developing cures. There seems to be two different ways of treating patients when looking at Imetelstat and Jakifi. Imetelstat targets the underlying disease and releaves the symptoms as the disease is affected. Jakifi releaves some symptoms of the disease while the underlying disease progresses. 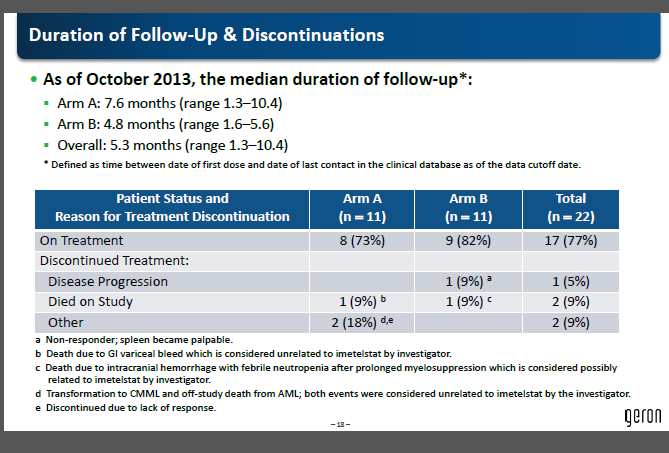 I can see why “Dr Tefferi is Uber Bullish on Imetelstat” to quote an analyst from the ASH presentation. You have a miss conception of how the stock Market works when you say Geron made a ton of paper money breifly on December 6th. The leak of the press release was done accidently by the Mayo clinic posting an embargoed PR on the Web. The leaking of the ASH Abstract was done by Adam F of the street.com. The night prior to the ASH abstracts being avialable online but under embargo I had a twitter conversation with Adam. I told him I expected there to be 3 or 4 CRs in Geron’s phase 2 MF trial. He responded then Geron would open at $1,000 dollars per Share. Adam was saying no way in hell Imetelstat would work. He was basing that on the breast Cancer and NSCL Cancer trial results he was ignoring the NSCL short telomere subset and the ET trial results. Geron ran multiple solid tumor trials for Imetelstat in the past and the Cash needed to run those trials is 2 times higher than the cost of an MF trial. Scarlett has said Geron has enough capital to run a Phase 2 MF trial $50 million plus the issue would be that they would need capital for a Phase 3 trial. The FDA allows for Accelerated approval of Breakthrough drugs and it can be done post Phase 2 like Seattle Genetics got such an approval. Scarlett has said in the past they will seek a Fast Track pathway for Imetelstat. Thanks, Taylor…you covered a lot of ground. Hopefully you’re not underestimating the cost of a multi-site, double blind Phase III international trial. Getting past dosage and toxicity trials are significant obstacles for this myelosuppressive drug but Geron probably does have the funds for that. Hundreds of millions of dollars need to be raised to take the next step. And for that Geron needs capital or a partner. We seem to be doing more debating with Adam F. than commenting on our own analysis published with detailed exhibits and analysis in MPNforum. Actually, I do understand how the stock market…and publicity… works. Geron is a Small Cap company with about 130 million outstanding shares. On December 6 the stock soared 26 % to $6.92/share after early release by “the company’s friends,” at the Mayo Clinic. Volume of trade on that day was 22 million shares versus 7 million the previous day. A stock chart accompanied my article. 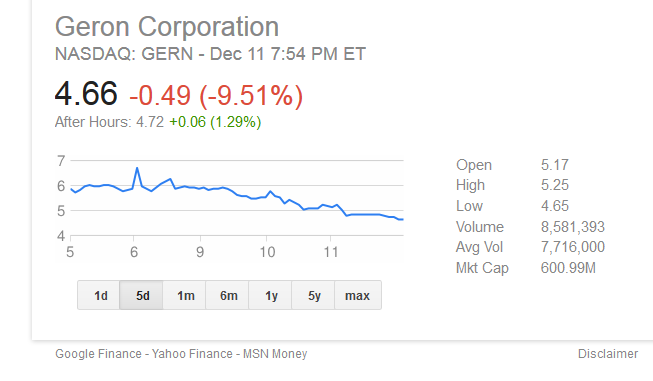 I claimed Geron – major shareholders –briefly made a ton of paper money. The more important issue is the “mistake” Mayo Clinic Rochester, home base of Dr. Ayalew Tefferi, made in premature release of information on the Mayo Clinic website causing that Friday feeding frenzy. Although I have worked in marketing communications, biotechnology, and medical instrumentation for several decades as group head and vp public relations for top agencies and corporations in SF and NY, I have never seen a lower level middle manager break news of this significance without authorization from the very top. I can’t even imagine how it could happen. Perhaps it wasn’t deliberate, but this action is of a piece with the aggressive stock and findings promotion accompanying the imetelstat report, one concern expressed in my article. It does us no good. We need quiet, clinical exploration of the possibilities of this potentially breakthrough drug. I’m impressed with imetelstat’s possibilities but for the rest you can read my article…or Adam’s.. Thank you Zhen for this reply. The premature press release at Mayo will hopefully remain the only odd event during the development of Imetelstat. “These were patients in the cellular phase of myelofibrosis,” he said. He also noted that 3 of the 4 patients who showed this bone marrow reversal did not have enlarged spleens, so they were relatively early cases, he said. One of the patients had essential thrombocytopenia with a very cellular bone marrow, and was very anemic. “These are very unusual presenting cases,” Dr. Silver commented. Dr. Silver is tied to Jakifi he was an Author on the Comfort 1 trial and is paid by Incy for his taking part in that trial. There is no disclosure of his ties in the article to Jakifi. That is a bizarre and frankly ignorant comment, Taylor. Dr. Richard Silver has been a principal investigator on many drugs and is by no means “tied to” Jakafi…as anyone who reads MPNforum, follows the MPNclinic, or knows anything at all about Dr. Silver’s strong support for the interferons and even-handed management of medical discourse. If you’re going to attack someone’s credibility, do your homework. I second Zhen’s reply here, Taylor Anderson. It’s only balanced, Taylor, to quote not only Dr. Tefferi’s response but the objections Dr. Richard Silver raised: indications of severe myelosuppression of the drug, the early stage MF (and one ET) presented in that small group, and the reversal of reticulin fibrosis shown in the slides versus the “striking and more severe myelosclerosis and bone marrow scarring seen in more advanced disease…” http://www.medscape.com/viewarticle/817940 So far all we have, aside from differing opinions by hematologists, are promising findings from a tiny, statistically insignificant group studied by a single investigator at one location for six months. As Dr. Silver concluded — and all of us agree, don’t you think? — further clinical investigation of imetelstat in myelofibrosis is warranted. We can hope imetelstat can help, but the jury is still out.